If you held LinkedIn, in your portfolio, you have lost more than 43% of your investment within a single day, and it is most likely to decline even further. In the current situation of flux, it is difficult to find an asset class where you can safely deposit your money. The stock market is dropping and has entered a bear market, the crude oil market continues to hit new yearly lows while, base metals have no buyers, making it difficult to find an asset class where one can invest. But in the sea of red, the oasis will be Gold. However, most of the experts in the media, as well as financial advisors, have advised you against buying the yellow metal. They claim it does not pay you a dividend yield, and that is just an asset whose value is determined by the market place. This may be true, but there are times when you want to safeguard your capital. Though Gold coins have been used since the 8th century, in China, accounts of their usage can be found throughout India’s history, which is many centuries older. Gold has been in existence for millenniums; it is not new. It is believed that 90%-95% of all the Gold that was ever mined, still exists in one form or another. Despite increased mining operations, Gold continues to generates interest amongst its’ buyers. The world was officially in a Gold standard from 1881-1913. This was one of the best periods of stability Globally and would have continued to do so in much the same way had it not been for WWI. Even during the Bretton Wood’s System, the world witnessed a fast-paced growth and inflation was contained and under control. With increased central bank interventions, the world is on the cusp of a major global financial crisis. 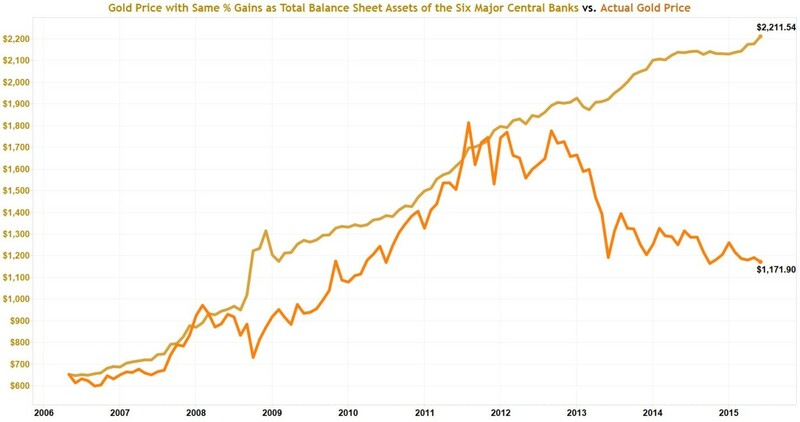 The world is currently witnessing unprecedented Central Bank interventions. The chart below displays a graph of the rise in the Central Banks’ assets to GDP of all of the major economies globally. 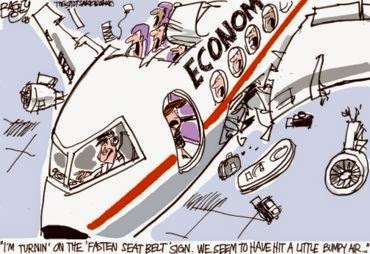 With yet another fresh round of QE, as announced by Japan and the EU, it appears that there is no end to the “madness”. How can we protect ourselves from the impending debacle? Even if Gold were to experience the same growth as the Central Banks’ assets, it should be trading much higher. 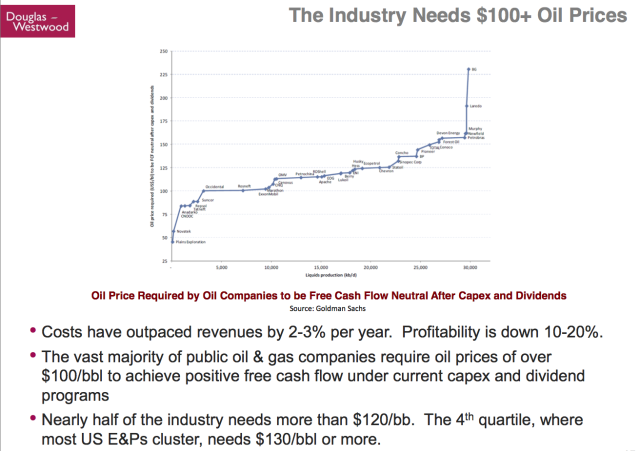 The chart below shows the valuation gap. With the world economy on tenterhooks, currency wars between nations are rapidly increasing. 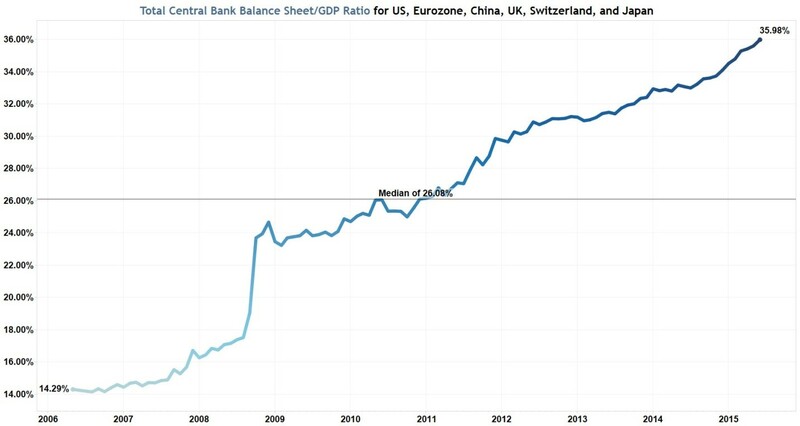 We have seen glimpses of such occurrences, when the Swiss Central Bank unpegged the Franc to the Euro, which in turn, led to massive bankruptcies. With talks of a Brexit and the European Union on a slippery slope, it has all the makings of the next big crisis. The famous commodity Guru, Jim Rogers, often states that ‘The US dollar is a terribly flawed currency’. History suggests a bullish future for Gold, but how has Gold performed during the current drop in equity prices? 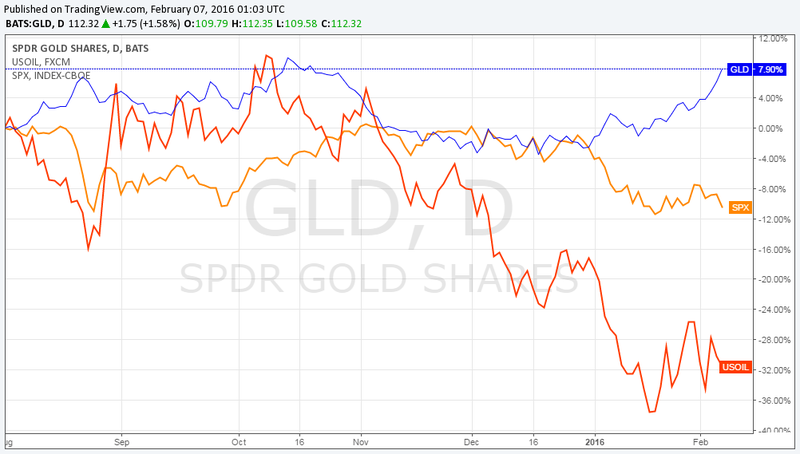 The below chart displays the comparative performance of the three important asset classes: Gold, SPX and Crude Oil. 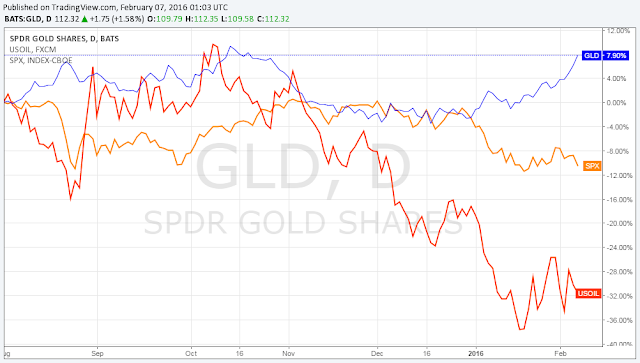 Gold is an outperformer while the other two are struggling to put in a bottom. Moving forward, with the US equity markets entering into a bear market. The confirmation of the bear market will be complete once the markets break their recent lows. Gold is the only “financial standard” in which you should invest during the current financial crisis. In short, Stanley Druckenmiller, amongst other informed investors, are purchasing Gold. In fact, Druckenmiller sees Gold as a ‘run’. I am not advocating that you should follow them blindly, but the data and the economic conditions suggest that this is the new. In order to benefit the Bull Market in gold. I will further advise you of the proper timing of the correct entry price. 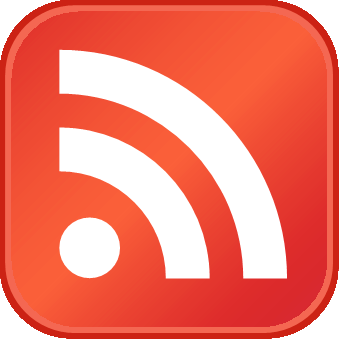 Be sure to join my free newsletter for future updates and trade alerts! In the past two months I have closed 11 trades with 9 of those being winners.